Your house is not really a home until you feel the overwhelming urge to smile when you drive up to it every single day. It’s the place you raise your children, the place you love, laugh and enjoy. It’s also the place you have to look at every single day, and there is no reason it should be anything less than exactly what you want. Whether your home is just not as exciting as you’d like or it needs a minor facelift, or you are looking to upgrade your curb appeal to sell your home sometime in the future, veneer stone siding is worth consideration. At The Window Broker, we love veneer stone siding. It looks just like real stone siding, but it’s far less expensive. It gives your home that amazing look of elegance and upscale appeal, but it doesn’t break the bank. You can apply veneer stone siding to your entire house, or just to your front columns. You can do a chair-rail type design to the front or even use it to upgrade your fireplace or your bar area in the kitchen. Something light, simple and made to last, veneer stone siding is the answer to your homeownership problems. It can turn even a beautiful home into one that’s breathtaking. It’s such a simple addition to any home, but it can add value and aesthetic appeal. Veneer stone siding might not be real stone, but it’s not something to discount. More homeowners than ever before are turning to this as a way of increasing the value of their home and attracting potential buyers. At The Window Broker, we love the idea of adding this type of siding to any exterior columns to create a grand look. Veneer stone siding is so affordable that you can put it on the entire house if you desire, and still not go over budget. 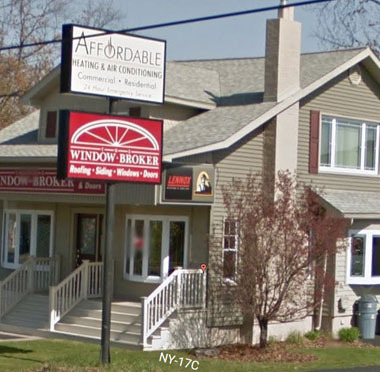 Call us at The Window Broker at (607) 798-9954 or fill out the form online to schedule a free estimate at your home. Our team of experts helps you decide how much veneer stone siding you need, where you want it and what type of work you want done. We then provide you with an estimate, answer your questions and we work with you from start to finish. There is nothing our team of experts cannot do to help you increase the value of your home as well as the overall curb appeal that you so desire. Call us today to get started changing the face of your home for the better.